Sunday July 2, 2017: We’re going to stay another day anchored at Prudence Island, in Narragansett Bay. Its a great summer day with bright, beautiful sunshine, a light breeze and its going to be hot. After breakfast, it was time to wash the boat cabin & decks from three days in Newport Harbour in high winds. The wash, rinse & wipe down of the bow, pilot house, salon and cockpit took four hours, but it sure felt good when it was done. We spent a relaxing afternoon on board. I even took a swim, and while I was in the water, Fran handed me a brush to give the hull waterline a scrub. This was my first swim of the season and the water was lovely. Swimming at Prudence Island anchorage! As we sat out in the cockpit and read our books, we were also quite entertained by the huge number of boats that came out to the anchorage for the day. However, far too many arrived running too fast and bringing big wakes with them affecting all the other boats in the anchorage. Three quarters of the boats were gone by sunset, leaving the anchorage calm and serene for the night. As darkness set in, we could hear the faint sound of fireworks far off in the distance. We learned that the local communities spread out the July 4th fireworks celebrations over multiple days. Today was certainly a relaxing, feel good day that left us feeling very refreshed. 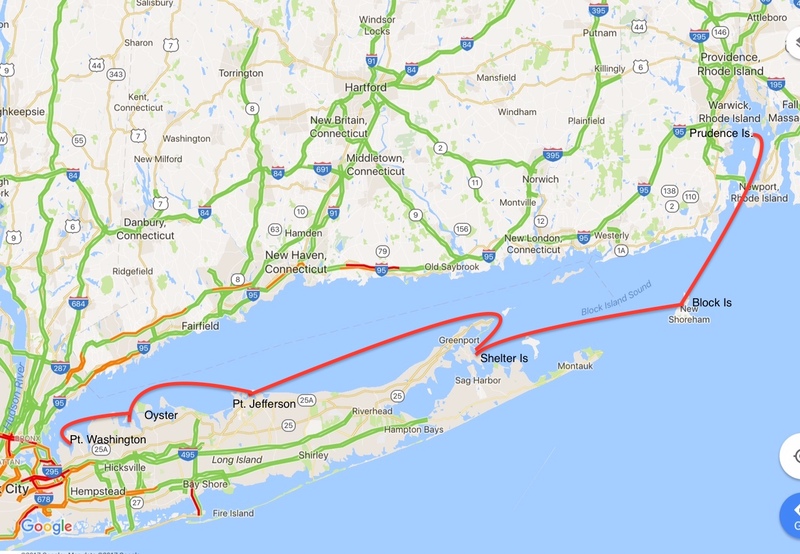 Monday July 3, 2017: Its another beautiful summer day with a forecast high of 30 degrees C. After a few discussions with Bob and Jan on Wings, we decided we’d head to Block Island on Buzzards Bay today and then gradually make our way west along the Long Island shoreline towards New York City. Block Island is located out in the Atlantic Ocean off the coast of Rhode Island and it was named after Dutch explorer Adriaen Block. The island has a population of just over 1,000 and 40% of its 9,733 square miles are set aside for conservation. Block Island is known as a summer tourist destination offering cycling, hiking, sailing, fishing and beaches. It also has two historic light houses. Block Island has a storied history of numerous conflicts in the 1600’s between its native population and the colonials. At one particularly low point, following the native murders of several colonials, the Governor of Massachusetts sent 90 men to Block Island with orders to “massacre all native men on the island”. Fortunately, after the fighting started, the bulk of the native population hid in the forests and only 14 were killed. While Block Island is part of Rhode Island, during the War of 1812 it was briefly occupied by British troops. Block Island has no natural harbour, but it did have a salt pond almost 1 square mile. In 1895, a channel was cut into the natural “Great Salt Pond” as it is called. The resulting anchorage now offers wonderful 360 degree protection with good depth throughout and it is a favourite cruising destination capable of accommodating hundreds of boats at anchor and on docks and moorings at its four marinas. 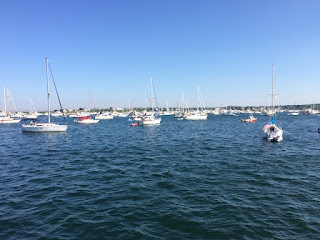 Block Island has plenty of beaches and shore attractions and on this 4th of July long weekend, it was packed with something in the range of 400 to 500 boats. Surprisingly, the anchoring was all very orderly among all manner of watercraft from paddle boats, small sailing dinghies, right up to mega yachts. 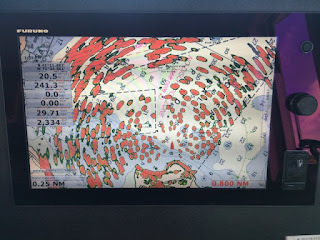 We took a picture of our radar screen showing red dots for all the boats in part of the anchorage to give you an idea of how full the anchorage was. 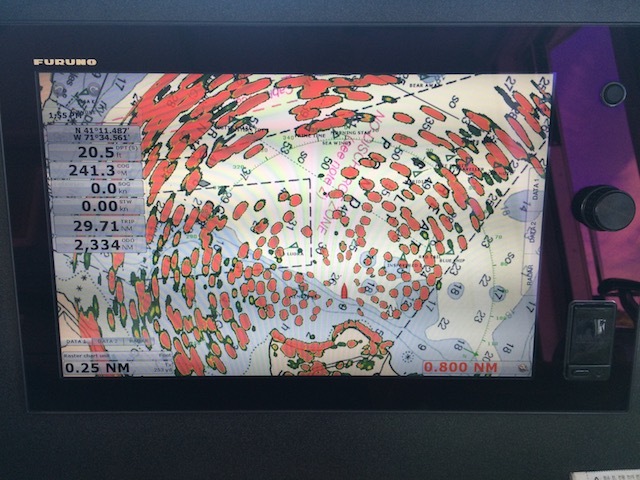 Screen shot of radar screen - each red dot is a boat! At night, the anchorage was really quite magical with the boats’ anchor lights plus many boats were lit up with coloured lights, neon lights, flashing lights, Christmas lights and more. It looked like a colourful floating village. Tuesday July 4, 2017: Happy Independence Day to all our American friends! 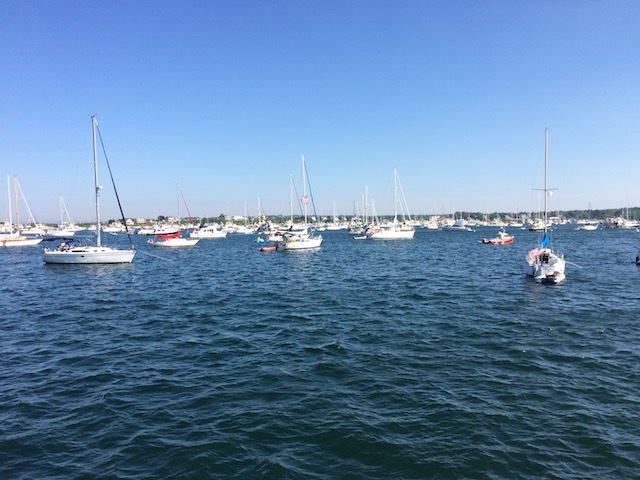 It is another beautiful morning (which we are getting rather used to) and we are underway at 0750 to cross Block Island Sound to the eastern end of Long Island, New York (our fifth state we’ve been boating in this summer). Crossing Block Island Sound was very relaxing. There was no wind and the water surface was glassy with just some light ocean swells leftover from yesterday’s wind. The ocean swells ended when we got protection from behind Montauk Point at the tip of Long Island. As we approached our anchorage, we heard a distress call to the Coast Guard on Channel 16 on the VHF marine radio. A couple had anchored on the east side of Plum Island and the husband had gone for a swim. The current got him separated from the boat and it was too far for him to swim back against the current. The wife did not know how to operate the boat and her husband needed to be rescued fast. The Coast Guard, plus Tow Boat USA plus another boat all responded immediately. They sought clarification on the exact location of the boat and the swimmer and the wife had good, clear answers. But as time went by, she reported her husband was trying to swim to the nearby island and seemed to be having difficulty and she was clearly becoming more distressed. At about the 20 minute point after her first call, the wife reported she couldn't see her husband and pleaded for the rescue boats to hurry. Within a few more minutes the rescue boats were on the scene and reported they had recovered her husband, and needed EMS, but there was no comment as to his well being. After the wife’s pleading for more information, the Coast Guard asked for a cell phone number they could contact her on. There was no more information forthcoming and we began to think the worst had happened. It wasn’t until the next day that I did a Google query and learned the 63 year old man had died from the incident. It was an emotionally draining event to listen to and it remained on our minds for the next few days. It prompted us to talk through our own emergency procedures and discuss ways to make it easier to perform boat operating duties in a stressful situation. BOATING CAN BE DANGEROUS! We chose Coecles Harbour (pronounced cockles) on Shelter Island for our stop today. The anchorage is known locally as the “jewel of the fishtail”, with fishtail referring to the shape of the mix of islands at the east end of Long Island. Coecles Harbour is a very well protected bay. We anchored in the one designated area for visitors and it was indeed a very lovely spot with beaches and a tree lined shore with lots of space for many boats. There were several Nordic Tug’s in the anchorage and we managed a short visit with very friendly couple aboard a local NT32 named Sun Rise. After a game of Five Crowns over Happy Hour with Bob and Jan, we enjoyed a lovely, quiet evening with a perfect sunset to end the day (trying to put the drowning event out of our minds). Wednesday July 5, 2017: We were up at 0500 hours this morning to prepare for our 0600 departure for Port Jefferson, a 50 nautical mile trip, westward towards New York City. There was a light east wind and by the time we got out of the harbour, we were enveloped in thick fog. To get out of Gardiners Bay at the end of Long Island, we had to pass through the narrow “Plum Gut Passage” which has stiff currents and some rip tides. We carefully made our way through the fog, feeling fortunate the boat traffic was light at this early time of the day. Thankfully, the fog lifted as we passed through Plum Gut in a two knot current that tossed us about for a short while before we were safely on our westward bound course in Long Island Sound. The sun came out and the wind and waves were from behind us, making for a very comfortable ride in the 1 to 2 knot current. Mid morning, our AIS showed us that a pleasure craft named Vibrant Curiosity was heading towards us. When I clicked on its icon on our chart plotter, I learned the boat (yacht?) was 279’ long and 46’ wide. That’s a lot of pleasure craft; way more than I can imaging running. Not many marinas could handle that sort of mega yacht. Port Jefferson was today’s destination and it has a very well protected harbour with a narrow entrance. The harbour is 1 1/2 miles long and 1/2 a mile wide with a small section set up for mooring balls and a very large area available for anchoring. 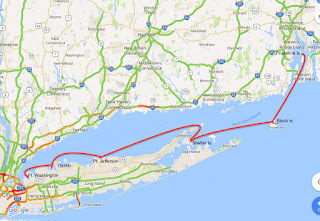 There is regular ferry boat traffic brining people and cars back and forth to Connecticut as an alternative to driving through New York City to get off of Long Island. Port Jefferson is a picturesque waterside village that has been revived from its industrial days and long history as a shipbuilding community in the 1800’s. We spent the afternoon exploring the village, where Fran found a salon to get a hair cut. Later, we joined Bob, Jan and Paul, a long time friend of Bob’s who lives on Long Island, for dinner at the Steam House, a local seafood restaurant. Once again, the wind died, a lovely sunset emerged and we enjoyed a quiet evening at anchor. Thursday July 6, 2017: Our next stop along Long Island is Oyster Bay. We had an overcast day, but light wind and modest waves, so it was a very comfortable run. While underway, New York City was gradually coming into view, far off in the distance. Oyster Bay was boyhood home to Theodore Roosevelt, the 26th President of the US and location of his “summer white house”. It is also home to John Gotti, former boss of the Gambino crime family and singer, songwriter Billy Joel. Oyster Bay is a very pretty and well maintained town. 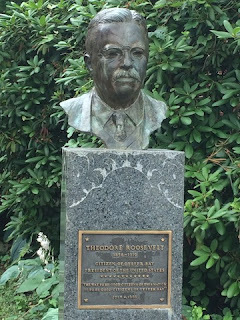 Upon arrival on shore we were first greeted by the Roosevelt Memorial Park on the waterfront, followed by a railway track and the commuter train station for those who make the daily trek into New York city to work. There are lots of Roosevelt things identified in town including his “boyhood Presbyterian Church”, a statue, the local voting station Roosevelt voted at while a politician in the early 1900’s etc. We enjoyed a lovely walk about town, a light lunch at Spinnakers Restaurant and Fran & Jan found a nail salon for pedicures! Later, as the sun came out, we took a dinghy cruise through the West Harbour and under the lift bridge to Oak Neck. 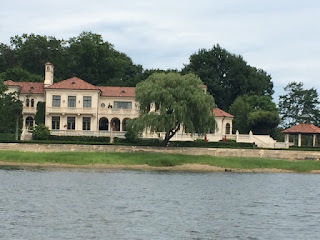 There were certainly many fine homes to view along the way reminding us that the Great Gatsby was filmed on Long Island.This was a great stop and a very well protected anchorage. Friday July 7, 2017: Well, it was unrealistic for those lovely sunny summer days to continue indefinitely. It is a cloudy, drizzly day and heavier rain is forecast. But the wind is 15 knots from the east (behind us) providing for a reasonably comfortable ride to our next destination of Port Washington. Excellent blog posting! I started watching old Billy Joel videos just because of that! Some of those currents you mentioned were fearsome indeed. I thought a 2 knt current at the Little Current bridge was bad enough!